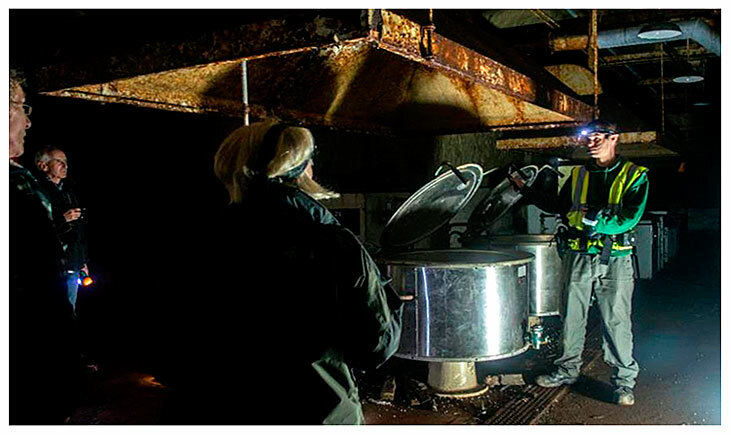 Open Days of Drakelow Tunnels are usually held every 3 months, please email us to find out when the next tour is. On the Open Day you will be shown round the complex by one of our volunteer guides and will visit sections of the Rover Shadow Factory, RSG and RGHQ Nuclear Bunker, which includes the BBC studio, Emergency Generator Room, GPO Telephone Exchange, Government quarters, Dormitory's and Decontamination Block. Photography is allowed in all sections of the complex, but due to the amount of visitors we recieve on Open Days, TRIPODS ARE NOT PERMITTED, this is for Health & Safety purposes. FOR OPEN DAYS PLEASE SEE OUR FACEBOOK PAGE. We expect the open day to be fully booked (as is usual with our open days) and have a strict 180 person limit. Prices are £10.00 for adults and £5.00 for children (aged 10-15) please note due to health and safety during the renovation, we are unable to accept children under 10-years-old to attend the open day. Payment is by cash on the day; please bring the correct amount if possible. 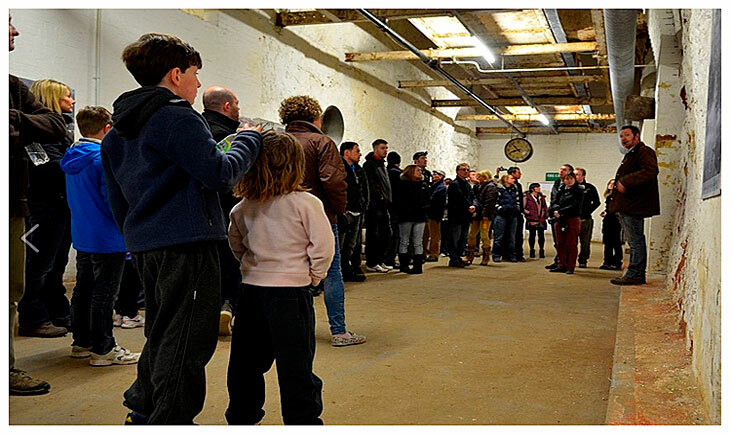 Our open days are a great opportunity to see the tunnels and learn their history. You will be guided through the old WWII Rover tunnels and then into the Cold War section. Parts of this vast bunker will be lit up but also parts of the old WWII tunnels have limited lighting, so bring a good torch. If you would like to attend, we need the full name of each person, if you are bringing a child (aged 10-15) please also put 'child' next to their name. Please use the Open Days link to send over your details on the contact page. Please note: places are strictly limited to 180 people. Tours tend to last between 45 minutes to an hour and a half, this depends on if people ask questions. We are quite happy to answer questions so don’t be scared to ask. Tours will be split into different times of the day. We will send a further email out with at least 4 days’ notice with the time you have been allocated. *Due to the design of the bunker we are sorry to say that wheelchair access is not currently available. There are working toilets but no refreshments/food so please bring your own (no alcohol) please also note, there is a No Smoking policy inside the bunker. Although Drakelow Tunnels are located 50ft underneath Kingsford Common, the tunnels can be quite cold, even in summer. The temperature inside is a constant 10°C / 50°F, so make sure to bring a jumper or coat. You will also need to bring a torch, as some older sections of the complex are still without electricity. Disabled visitors who wish to visit the complex, please contact us beforehand, as there are currently no wheelchair ramps in place in some areas of the bunker. Children under the age of 10 are not permitted into the complex for Health & Safety reasons. Open Day at Drakelow Tunnels - Tour Guide, Caretaker Mr. Sid Robinson. Photo courtesy of Mr. Michael Scott. Private Tours can be booked in advance on a weekday evening (except Friday's), please email us to find out more. Our minimum requirement is 15 people per tour. On the tour you will be accompanied by one of our volunteer guides and will visit the Rover Shadow Factory and R.G.H.Q. The Nuclear Bunker includes: BBC Studio, GPO Telephone Exchange, Government Offices, Emergency Generator Room, Water Treatment Plant, Communications Room, Dormitory’s, Decontamination Block and Maintenance Bays. Photography is allowed in all sections of the complex although tripods are only permitted on photography tours and not private tours. Private Tour of Drakelow Tunnels - Tour Guide, Volunteer Mr. Michael Scott. Photo courtesy of Miss Jo Emery. Private Tours are also available to Photographic Societies for: Model shoots, Vehicle shoots, Light painting or just Private Tours. 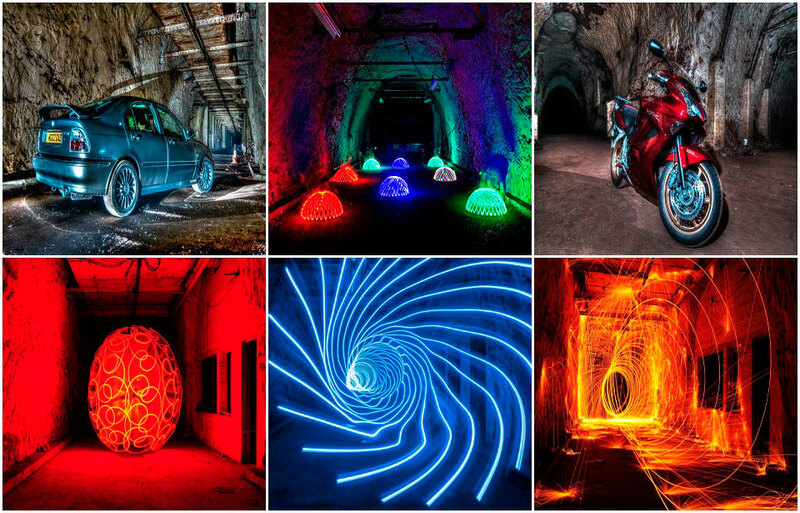 Photos from Birmingham Photographic Society Private Tour - Vehicle Shoot & Light Painting. Photos courtesy of Mr. Chris Wilkins & Mr. Michael Scott.